Dillingham Democrat Rep. Bryce Edgmon was also nominated for speaker by Chris Tuck, a Democrat from Anchorage. However, Tuck withdrew his nomination for Egmon following the tie vote for Talerico. Republican Rep. Dave Talerico, R-Healy, talks to Anchorage Democrat Chris Tuck on Jan. 15. There is no clear majority in the Alaska House of Representatives -- without it, the body cannot form committees or introduce bills. 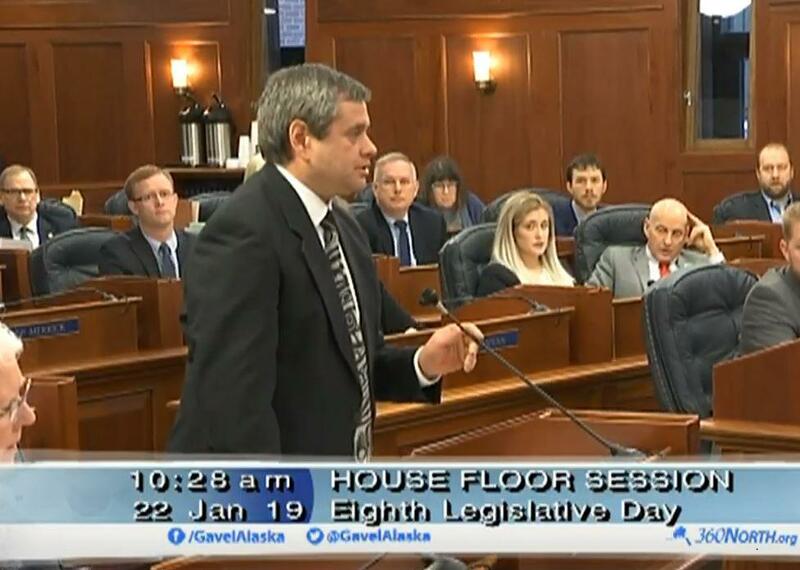 Healy Republican Rep. Dave Talerico fell one vote short of being elected the speaker of the Alaska House of Representatives Tuesday. There was a tie vote, 20 to 20, for Talerico. This was the latest action in the stalemate that’s preventing the House from beginning work this session. North Pole Republican Rep. Tammie Wilson noted there’s a House rule requiring votes on speaker nominations on the eighth day of the session. Chris Tuck, D-Anchorage, moves to withdraw the nomination for Bryce Edgmon, D-Dillingham. All but three House Republicans voted for Talerico. The three Republican “no” votes were Gary Knopp of Kenai, Gabrielle LeDoux of Anchorage and Louise Stutes of Kodiak. Knopp said he voted against Talerico to allow for a bipartisan majority coalition. All 16 Democrats and independent Dan Ortiz of Ketchikan also voted against Talerico. The House can’t form committees or begin its work on bills until it elects a permanent speaker.